Greensfelder was recognized at the 2018 Art on the Square festival in Belleville, Illinois, for the firm’s commitment to supporting the annual arts event. 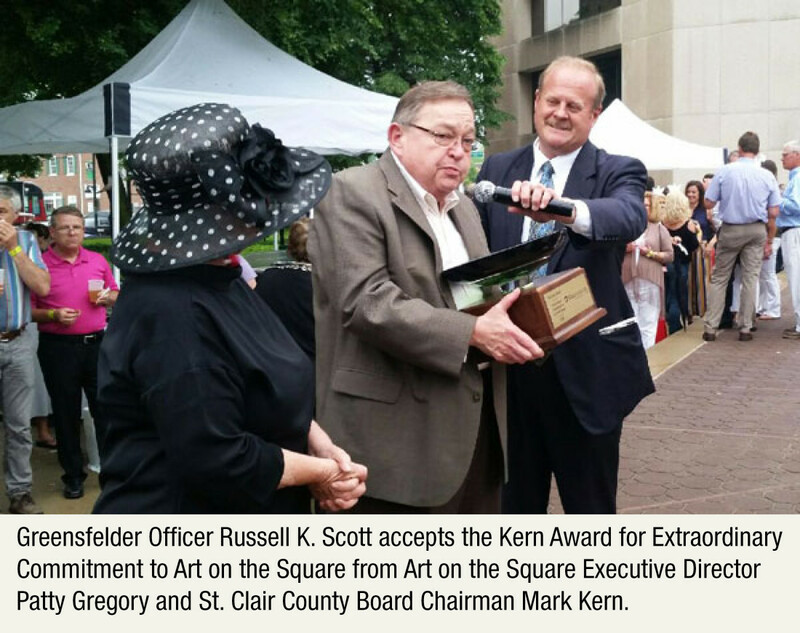 At the “A Royal Affair” opening reception May 18, Greensfelder was presented the 2018 Kern Award for Extraordinary Commitment to Art on the Square. Russell K. Scott, who leads Greensfelder’s Belleville office, accepted the award on behalf of the firm from Patty Gregory, Executive Director of Art on the Square, and Mark Kern, Chairman of the St. Clair County Board. Greensfelder is a proud sponsor of Art on the Square, a three-day juried fine arts show that features original works by more than 100 artists. In addition to supporting the show, the firm also sponsors Art on the Square’s Poster Preview Party.